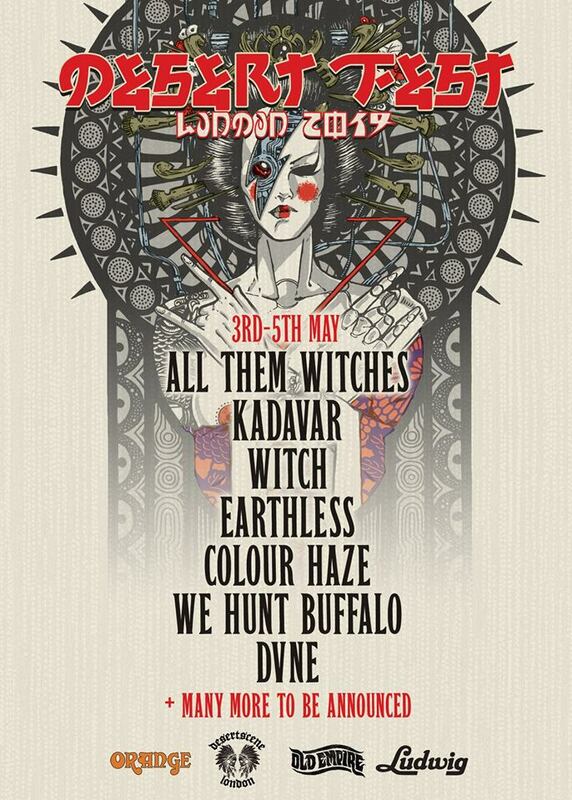 Home » News » All Them Witches, Kadavar, Witch & More Confirmed For DESERTFEST LONDON 2019; Tickets On Sale Now! All Them Witches, Kadavar, Witch & More Confirmed For DESERTFEST LONDON 2019; Tickets On Sale Now! Following their biggest year to date, DESERTFEST LONDON returns for its eighth year in 2019! Following the biggest year to date, DESERTFEST LONDON returns for its eighth year. As the 2018 line-up encompassed some of the most legendary and diverse acts the festival has ever seen, with Napalm Death, Hawkwind and Monster Magnet, to name just a few – the bar has been raised and the stakes are even higher for the UK’s best stoner rock & doom festival to pull out all the stops once again. So, with that Desertfest are set to reveal the first seven acts who will be making up the 2019 edition of the festival, which will be taking over the streets of Camden Town in a smoke-filled haze throughout the May bank holiday weekend. One of the most exciting, genre bending bands of recent time, ALL THEM WITCHES dark blues sound is one that has given the four-piece a reputation few could ever dream of. The Nashville natives take their deep Southern groove and effortless straddle the fence of psychedelia, blues and hard rock with unrivalled precision. Their live performance etched its way into our memory like few who have come before them, so we are beyond excited to share their musical genius at Desertfest; ALL THEM WITCHES are forging their own path and we highly recommend jumping on the journey, because it’s definitely going somewhere special. Iconic doom quartet WITCH will bring its Sabbath-come-Zeppelin-influenced hard rock sounds to British shores for the first time in over a decade at Desertfest 2019. With Dinosaur Jr’s very own J. Mascis at the rhythmic and creative helm, music industry maverick and bass master Dave Sweetapple, Kyle Thomas on vocals and Graham Clise on guitar, their self-titled debut album struck its cords deep into the heart of the doom scene. Desertfest are truly honoured to be playing host to the return of WITCH, the band have released some of the most hook-heavy songs of the modern age and despite rarely playing live, their seminal stoner rock sound will be a performance to remember. COLOUR HAZE will also be joining the 2019 proceedings, with one of the most incredible psychedelic light shows accompanying their perfectly tripped-out sound. Plus on the bill will be Vancouver fuzz lovers WE HUNT BUFFALO, whose brand of prog-minded fuzz rock has been stampeding out of amps and trampling audiences since 2010 plus Edinburgh’s melodic sludge monsters DVNE.